What Is a Computer Stick? A computer stick — sometimes referred to as compute stick, PC stick, PC on a stick, computer on a stick, or screenless PC — is a single-board, palm-sized computer that somewhat resembles a media streaming stick (e.g. Amazon Fire TV Stick, Google Chromecast, Roku Streaming Stick) or an oversized USB flash drive. Computer sticks feature mobile processors (e.g. ARM, Intel Atom/Core, etc. ), graphics processors, flash memory storage (between 512MB and 64GB), RAM (between 1GB and 4GB), Bluetooth, Wi-Fi, operating systems (e.g. 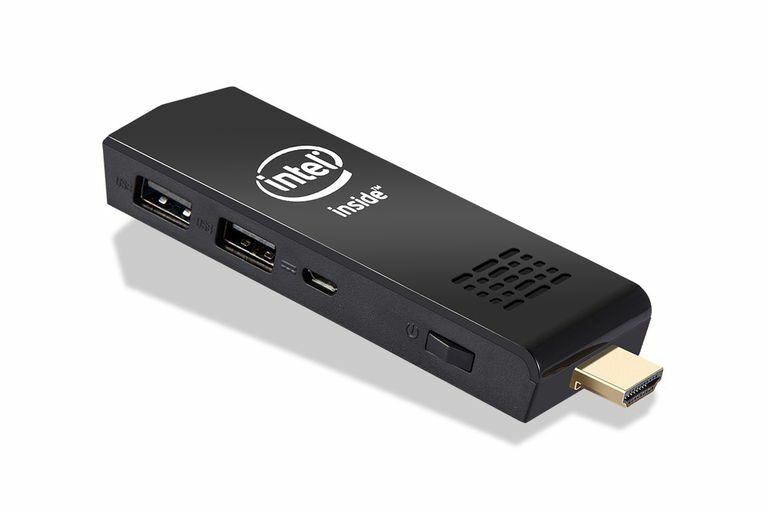 a version of Windows, Linux, or Chrome OS), and an HDMI connector. Some computer sticks also offer microSD card slots, micro USB, and/or USB 2.0/3.0 ports for storage/device expansion. Once plugged in, the computer stick will start its boot sequence; switch the television/monitor input to the HDMI port with the computer stick in order to view the system’s desktop. After you pair a keyboard and mouse for full control (some computer sticks have mobile apps that serve as digital keyboards), and connect the computer stick to a local wireless network, you’ll have a fully-functioning computer ready to go. Due to the limitations of hardware, computer sticks don’t make the best choice for processor-intensive programs/apps (e.g. Photoshop, 3D games, etc.) and/or multi-tasking. However, computer sticks do have an attractive price-point–generally between $50 and $200, but some can cost upwards of $400 or more–and are ultra-portable. When combined with a folding Bluetooth keyboard (generally not much larger than many smartphones) with touchpad, computer sticks gain the advantage of flexibility and power for the size. Secondary Family PC: Instead of getting the kids their own desktop (and desk and chair and finding space to put it all), you can turn any compatible television into a computer for them to use. This lets them surf the web, run apps, or play games, all on a big screen and without you having to grant access to your personal/work devices. Plus, if it’s on the main family television, it’s easier to monitor the kids’ activity. Smarter than a Smart TV: Smart TVs are great, but they do have some constraints (e.g. limited apps/support versus what mobile devices have with Google Play or iTunes, connecting a Bluetooth mouse/keyboard can be finicky, TVs aren’t very portable, etc.) that are hard to get around. A computer stick can do everything a Smart TV can (and more) as well as turn any television (with HDMI port) into a Smart TV. Travel Companion: Laptops (with power brick and cables) can be heavy and bulky to carry around, especially on flights/vacations. Have a work presentation or trade show to do? Plug a computer stick into a projector/TV to run (and even edit on the fly) PowerPoint slides or video. Relaxing in a hotel room? Use a computer stick like a media center to stream your favorite media (e.g. Hulu, Netflix, etc.) or music on the room’s TV screen.